When it comes to the prospect of more Star Trek, we are all Tilly in this frame. We’re returning to the Alpha Quadrant a bit sooner than we expected: although Star Trek: Discovery won’t air until next year, we’re getting to explore the lives of four of its characters in a few weeks’ time, as part of the Short Treks short series. While we knew that the four Short Treks shorts would begin airing this year after Discovery’s San Diego Comic-Con panel, CBS has now officially confirmed that Short Treks will begin releasing from October 4, with each one of the 10-15 minute episodes airing on a monthly basis between now and Discovery’s return. “Runaway” (Thursday, October 4)—Onboard the U.S.S. 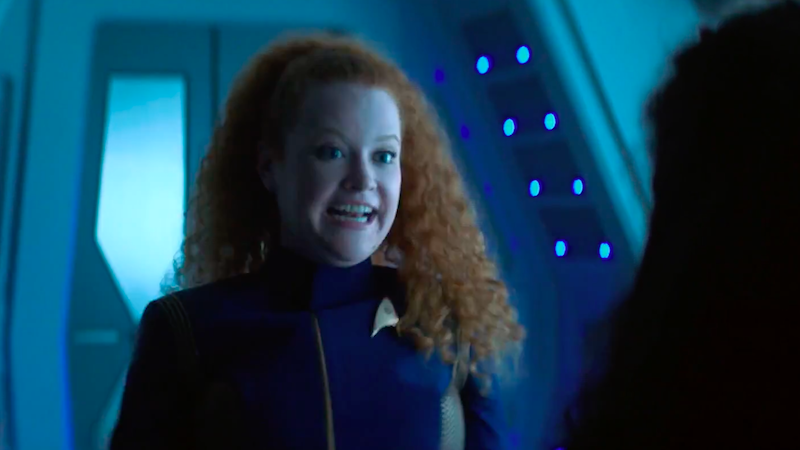 Discovery, Ensign Tilly (Mary Wiseman) encounters an unexpected visitor in need of help. However, this unlikely pair may have more in common than meets the eye. “Calypso” (Thursday, November 8)—After waking up in an unfamiliar sickbay, Craft (Aldis Hodge) finds himself on board a deserted ship, and his only companion and hope for survival is an A.I. computer interface. “The Brightest Star” (Thursday, December 6)—Before he was the first Kelpien to join Starfleet, Saru (Doug Jones) lived a simple life on his home planet of Kaminar with his father and sister. Young Saru, full of ingenuity and a level of curiosity uncommon among his people, yearns to find out what lies beyond his village, leading him on an unexpected path. “The Escape Artist” (Thursday, January 3)—Harry Mudd (Rainn Wilson), back to his old tricks of stealing and double-dealing, finds himself in a precarious position aboard a hostile ship — just in time to try out his latest con. Short Treks will air on CBS All Access starting October 4.